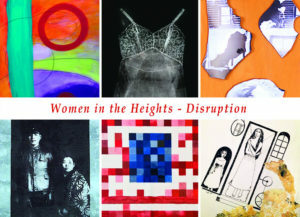 In celebration of Women’s History Month, NoMAA in partnership with Broadway Housing Communities and the Sugar Hill Children’s Museum of Art and Storytelling present the exhibition “Women in the Heights – Disruption,” featuring the work of 28 women artists of Uptown Manhattan. Curated by Andrea Arroyo. Participating artists: Beatriz Albuquerque, Karen Berman, Susan Bresler, Amara Clark, Rose Deler, Diane Drescher, Sharese Ann Frederick, Julann Gebbie, Xóchitl Gil-Higuchi, Michelle Orsi Gordon, Wilhelmina Grant, Dianne Hebbert, Maggie Hernandez, Fernanda Hubeaut, Anna Lambert, Lilia Levin, RoughAcres/RL McKee, Alexandra Momin, Nancy Palubniak, Lysander Puccio, Leticia Quezada, Nancy Rakoczy, Diana Schmertz, Adrienne Stamler, Renata Stein, Rachel Sydlowski, Yasuyo Tanaka and Yona Verwer/Katarzyna Kozera. 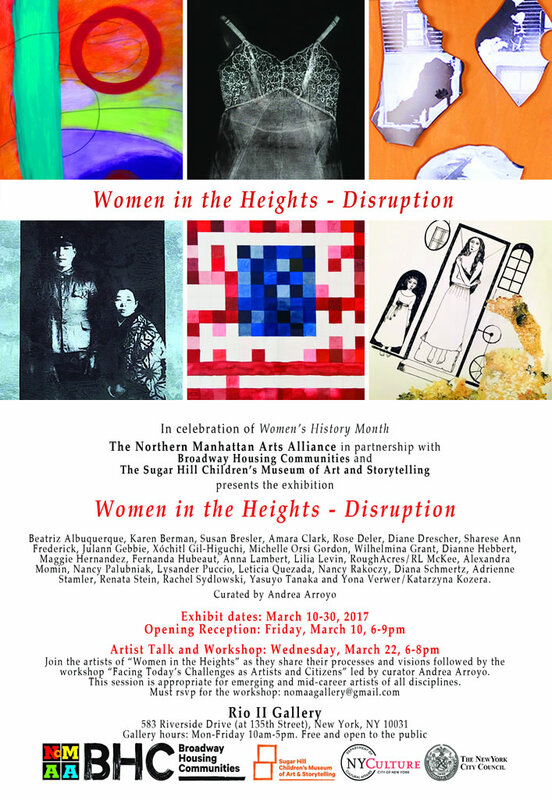 On Wednesday 22 March 2017, 6–8pm, join the artists of “Women in the Heights – Disruption” as they share their processes and visions, followed by the workshop titled “Facing today’s challenges as artists and citizens.” This workshop is appropriate for emerging and mid-career artists of all disciplines.